Edward Byrne's blog earlier this week mentioned Tipton Poetry Journal (oh, and also Reader's Digest). 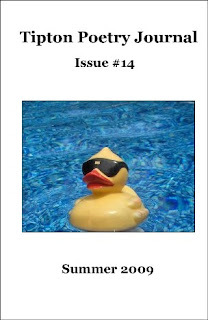 Issue #14 (Summer 2009) of the Tipton Poetry Journal has been published and is available now in both print and online versions. William Aarnes, CL Bledsoe, Zoë Bogart, Michael Brockley, Edward Byrne, Antonia Clark, Joan Colby, Curtis Cronn, Holly Day, Flor Aguilera García, Louis Gallo, Tina Hammerton, Ronnie Hess, Allan Johnston, Laurie Junkins, Karen Kelsay, Ginger Ko, Norbert Krapf, Janet Krauss, Jack Kristiansen, Sarah Layden, Sandee Lyles, Bonnie Maurer, Tracy Mishkin, Kristine Ong Muslim, Anne Britting Oleson, Richard Pflum, Doug Ramspeck, Greg Schwartz, William Sea, David Shumate, Noel Sloboda, Janice D. Soderling, Keli Stafford, Garland Strother, James Tipton, Tom Þorgautr, Georgia Wallace, Calvin White, Martin Willits Jr., Susan Yount, and Fredrick Zydeck. My poem "life and death on the plasma" has been published in the Summer 2009 issue of Boston Literary Magazine.